WHY: The people of Riverview Baptist Church believe God designed the family to be the primary disciple-making relationship. In other words, God gave parents the privilege of nurturing faith in the next generation. That’s why the Faith Path was created, as a step-by-step plan to help you be intentional as you prepare for key faith milestones and foster spiritual disciplines in your child’s faith journey. WHAT: The Faith Path strategy is intended to help you develop a clear plan to intentionally point your child toward Christ in an age appropriate manner. We hope that you are naturally exposing your child to many of these faith practices from an early age. The Faith Path recommends focusing on particular practices or preparing for certain milestones at specific ages and stages. We will provide you with free kits that include training, resources and ideas to help you guide your child along the path. WHEN: You can start today regardless of your child’s age or stage of development. Don’t worry if you miss a step or if you start the process with an older child. You can always go back and emphasize earlier steps. We also encourage you to reinforce these practices as your child matures rather than view them as a one-time emphasis. You’ll find recommended resources and ideas for beginning each step in your child’s life and continuing as he or she matures. Every step along the Faith Path is intended to guide and direct your child toward becoming a fully developing follower of Jesus Christ. At some point along the way, your child will be mature enough to make a clear decision to trust Christ as his or her Savior and then follow the Lord in believer’s baptism. We have created material to assist you in leading your child to Christ and understanding salvation. When that wonderful event occurs, we would love to provide you with a special Salvation & Baptism kit containing resources to help you celebrate. (Recommended focus: Birth – 2 years) Make a commitment to raise your child in a Christ-centered home. (Recommended focus: Ages 3+) Establish the practice of praying for and giving a blessing to your child on a routine basis. (Recommended focus: Ages 4+) Establish the practice of connecting as a family while passing spiritual truths to your child. (Age will vary: kit provided at Age 5+) Learn how to lead your child to Christ. Although it may be several years before your child expresses an interest in becoming a Christian, now is the time for you to prepare for those discussions. (Recommended focus: Ages 6+) Teach your child about prayer and establish the practice of praying as a family. (Recommended focus: Ages 7+) Teach your child about God’s Word and establish the practice of reading and memorizing scripture as a family. (Recommended focus: Ages 8+) Establish the practice of adoring God personally, at home, at church and as a lifestyle. (Recommended focus: Ages 9+) Establish the practice of giving and serving others for God’s glory. (Recommended focus: Ages 11+) Discuss the changes and challenges of puberty with your child. 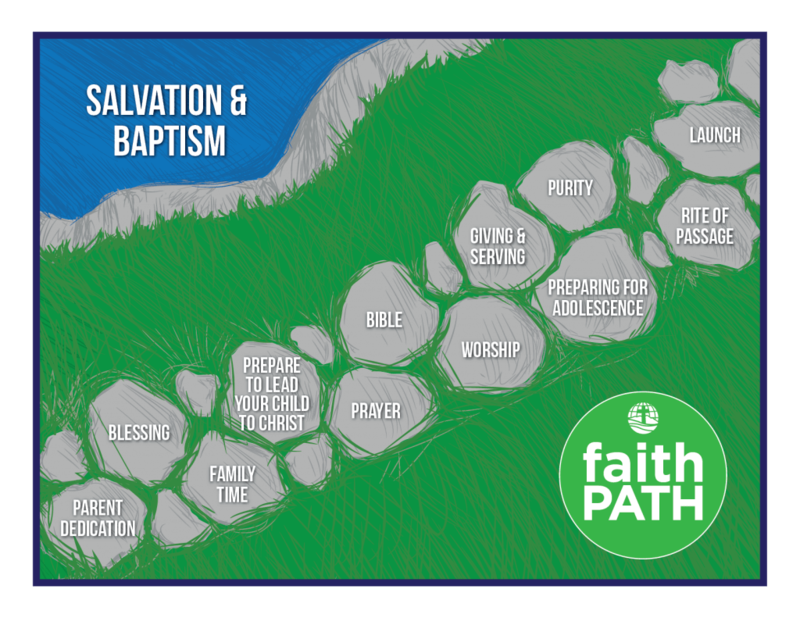 (Recommended focus: Ages 13+) Prepare and challenge your child to cherish and commit to purity. (Recommended focus: Ages 16+) Celebrate and give your child a vision for the future as an emerging adult. (Recommended focus: Ages 18+) Coach your child to move toward college and/or career and adult independence. (Age will vary) When your child trusts Jesus Christ as Lord and Savior, create a time of celebration and guide your child into believer’s baptism.